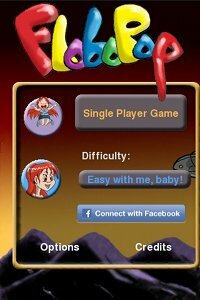 Free, fun and casual, FloboPop is the new version of the legendary FP, the awesome arcade game enjoyed by millions, made even more addictive! It's so easy, yet so challenging: its funny pups and opponents know how to heat the game every time. 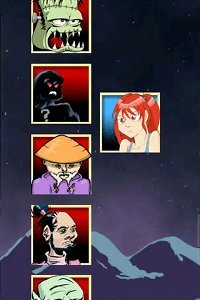 Simple and fun: Choose a difficulty level and try to beat the 9 opponents of the single-player mode to finally reach the highly coveted hall of fame. Rules are so simple that no learning is needed to have fun, but you'll finally realize that deeper strategies can make a real difference. 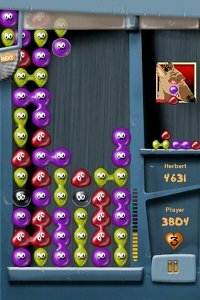 Addictive: Challenging the single-player mode will surprise you as every opponent adopts some specific strategies. Learning how to make the biggest combo is the quest of a life. Community: Facebook integration allows you to compare your score with your friends. Connect FloboPop to Facebook and join the competition! The interface presents two playing fields: yours and that of your opponent (human or AI). Pairs of colored blobs called pups will fall down. By sliding and taping the screen, you should turn them around and place them in order to form groups of four pups of the same color that will blow up. To spice up the game, the performance of a player allows him to send malus to his opponent. This malus takes the form of balls of glass that make it harder for him to complete his groups of four pups. In addition, if in the process of blowing up four pups, other pups are rearranged to form another set of four, your opponent gets a whole row of glass balls! The idea is to get your opponent to overflow his screen before you. Very simple, the difficulty of the game increases while your opponent becomes stronger and the game faster.